It all starts with the big lovable monkey Donkey Kong watching TV. As most big monkey�s do in their off time of course. Lo and behold Donkey Kong sees an ad for the season�s latest hot toy to have. These are little wind up plumbers; Donkey Kong falls for these in a big way and must have one for his very own. But much to Donkey Kong�s dismay the hot toys are of course sold out. What�s a big ape to do? Why fly into a monkey rage, raid the toy factory itself and steal as many little wind up plumber toys as you can! 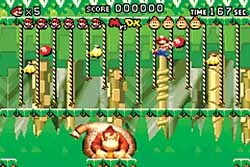 Now it�s up to Mario to get those toys back, what Mario ends up facing is multiple levels of chasing after Donkey Kong and rescuing the toys. Each of the levels ends with Mario saving one of the precious toys. 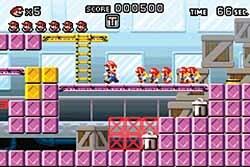 The game�s beginning six levels or worlds have about eight objectives that Mario must win over to progress. The first six worlds are pretty much cut and dry standards for this kind of game. Making his way through each world Mario has to do things like finding a key for a locked door and this is where things look a lot like the old Mario we all know. Objects such as keys and other things that Mario can grab hold of are carried over his head. Hey it�s easier to throw stuff that way I guess, and that is exactly how things are resolved really as items are thrown at enemies and keys are carried to eventual use for locked doors. 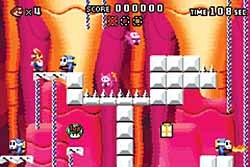 The other parts of the game are pretty much run of the mill navigation past obstacles, hitting switches along the way to get ladders, platforms and even walls to move into a position so that Mario can utilize them for advancing onward, or obtaining a goal on the level. Past the first few levels/Worlds things change a bit as Mario must lead the toys safely to a toy box. All the while trying to make sure they don�t get destroyed along the way. Not as easy as it sounds because they sure break rather easily. Well, at least I kept getting them destroyed. Around the eighth level of each world is a battle with Donkey Kong. One would think this would be a bore after a while but there is just something macabre and addicting about wanting to beat Donkey Kong. Knowing the nifty moves that Mario can do can very well be the key to victory and toy risqu� in this game. Don�t despair because you will get a chance to learn the moves thanks to some nifty tutorial type levels. Mario can do a lot more than I have ever seen him do in past games. Wire hanging is a new trick, as well as flips and even hand stands, Ladders are not the only thing to get around on, and vines can also be climbed as well. Mario is a pretty agile guy and players are going to be using all of his tricks and moves in this game. In the graphics department the characters have a rather different look to them than most other games, I just can�t shake the feeling as I play it, though nor can I best describe it. A prerendered look maybe, now that�s not a bad thing mind you. The games look and feel while all new this day and age feel there was enough of the original games to make me reminisce of the older days of coin op games. 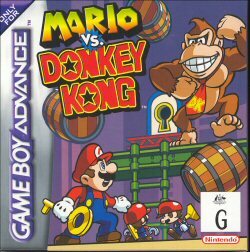 Mario Vs, Donkey Kong is a surprise indeed and for those that love the puzzle like games and the ever so fun working your way past obstacles, then this game is for you. After playing it, you may just be hooked on to this darn game and even craving more. Don�t worry; the game is a short one but not as short as the information for the game leads one to believe. Beat the six main worlds and you get a big reward�six more worlds each of these having levels as well, and if you�re really really good you can unlock the expert levels. For those long plane trips or vehicle rides, this game will be a very welcome diversion.